Kangaroo is a knockout! A new 1 or 2 player adventure challenge that will keep mom, dad, and the kids hopping back for high jumping excitement game after game. 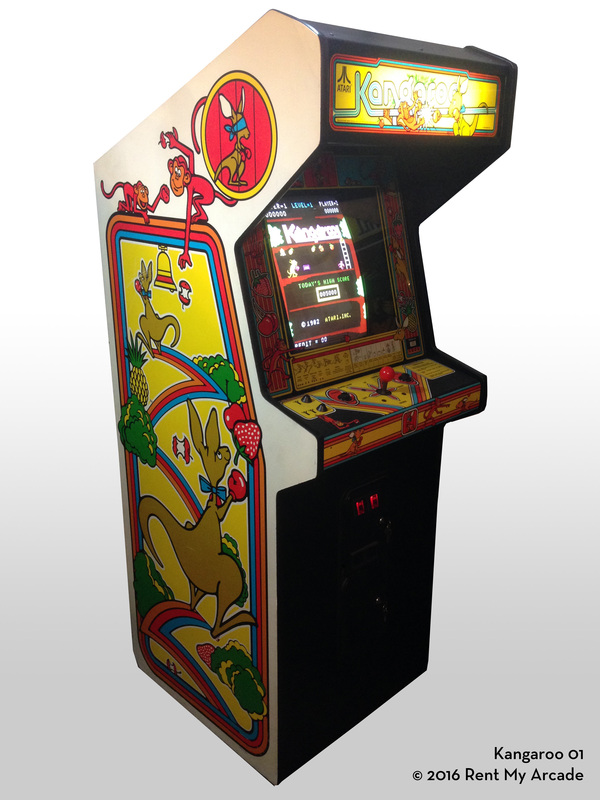 Mother kangaroo must rescue her "Baby" who has been kidnapped and held captive by a nest of "nasty" monkeys. Mother must hop through various obsticles, jump over or duck apples thrown at her by hoodlum monkeys or punch them out to reach Baby imprisoned in a cage at te top of the screen. Along the way she can collect different kinds of fruits for extra points. There are four rounds per skill level. Each round is complete when Mother rescues her baby. "Oh Susanna" plays and the word "Mom" flashes on the screen. As the player advances into higher skill levels, Mother must move more quickly to avoid flying apples and apple cores as the monkeys become more agressive and increas in number. If a player stalls and does not punch any of the monkeys or apples, "Big Ape" a giant Gorilla appears wearing boxing gloves. He will steal Mother's gloves leaving her defenseless. Mom's gloves are returned to her after a few seconds. In the meantime, she must be fast on her feet or risk getting beaned by an apple or punched by one of the monkeys. Round 1. In the first round there are ladders between each platform on the playfield. Mother must climb up the ladders to reach Baby. Round 2. In the second round Mother must jump up a series of log steps at different heights to rescue Baby at the top of the screen. Round 3. In the third round the monkeys form a column with Baby in a cage at the top of the column. Mom must punch out the monkeys and/or leap to higher platforms alongside the cage. Round 4. In the fourth round there are long and short ladders with Mother must climb to reach Baby. H: 71", W: 25.25", D: 32"